This post is in partnership with Milo’s All views, opinions, and love of good high-quality tea made with natural ingredients are all my own. Thanks for supporting the brands we love. The Hot Buttered Rum cocktail gets a fall holiday twist with pumpkin spice! Warm up with a Pumpkin Spice Hot Buttered Rum! This hot toddy is made with brown sugar pumpkin butter, dark rum, and hot tea. 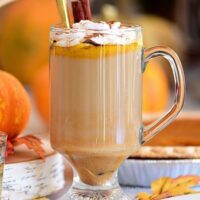 While I will forever love Mulled Wine and our Smashing Pumpkin Cocktail, this Pumpkin Spice Hot Buttered Rum is a crowd favorite, especially during the holidays. Can you believe Thanksgiving is just around the corner? That means it’s time to start planning that perfect drink to accompany your holiday meal! As cold weather begins to settle here, warm cocktails make their way into our drink rotation — like hot buttered rum. 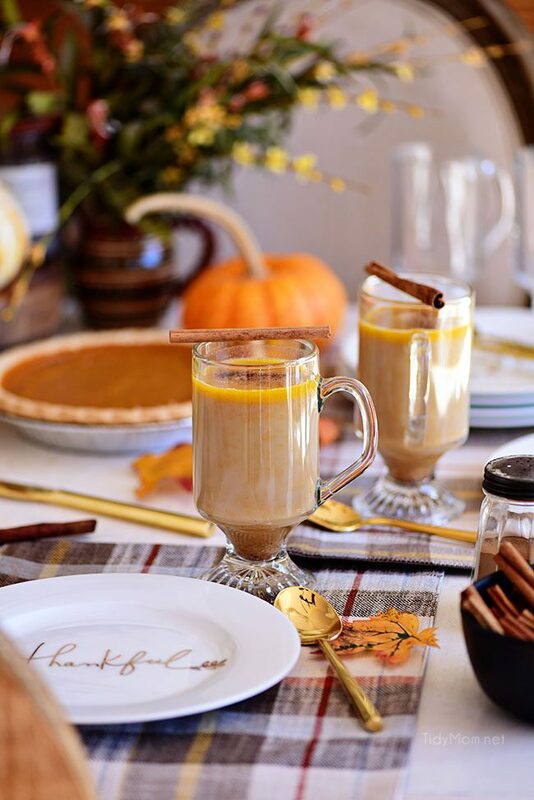 This holiday recipe makes the sweetest, warmest, creamiest pumpkin drink… with a beautiful cappuccino color made with Milo’s award-winning tea – absolutely perfect to warm you up after a day in the snow. Toss in a cinnamon stick and top with a dollop of whipped cream and dash of nutmeg if you really want to impress. 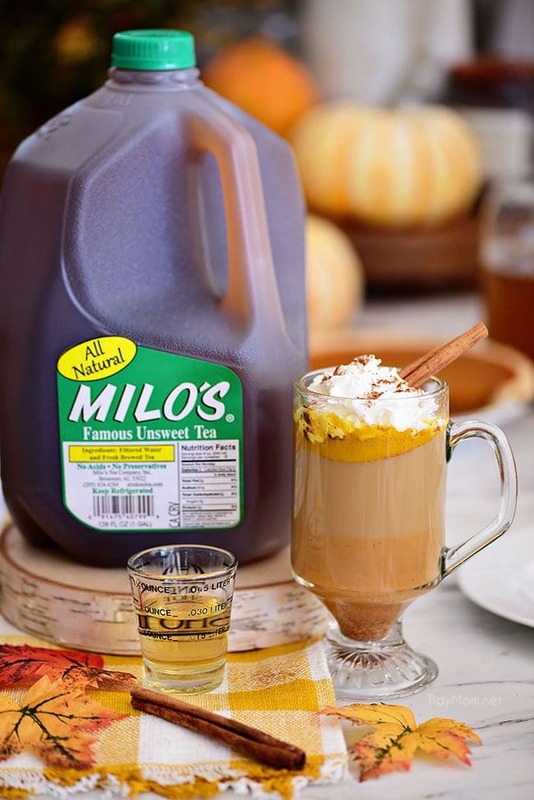 Milo’s Tea is THE ideal beverage for holiday meal entertaining and get-togethers. This is a warm, soothing cocktail that really hits the spot when the outside temps start falling. Hot Buttered Rum dates back to colonial times. Hot, spiced alcohol-spiked beverages have been used for centuries to fortify souls against bitterly cold winters. I know what you’re thinking…..adding butter to a cocktail may seem a little out of the ordinary, but the pat of butter adds a richness that makes a Hot Buttered Rum cocktail so special. 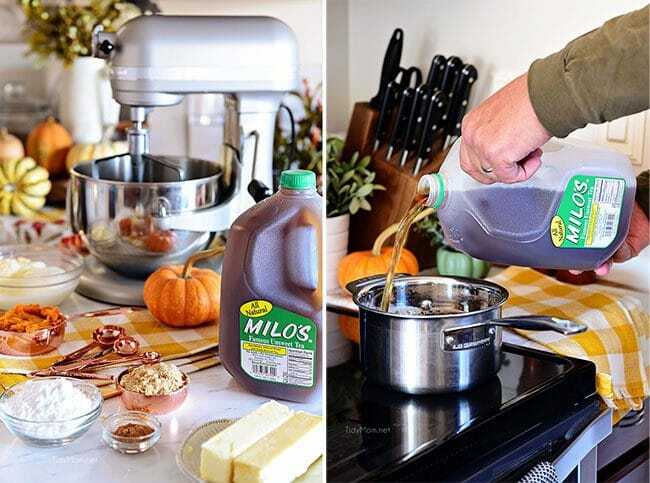 While some hot buttered rum recipes call for just a pat of butter and hot water or cider, this version calls for butter batter or a sweet pumpkin butter batter to be exact, vanilla ice cream and Milo’s unsweetened tea! The tea is an easy way to add some flavor while the butter batter and ice cream, are what makes this boozy recipe so creamy and comforting. Hot buttered rum starts with a batter that is made ahead of time and stored in the freezer or refrigerator until ready to serve. This pumpkin hot buttered rum batter recipe is made with butter, brown sugar, powdered sugar. pumpkin puree, pumpkin pie spice and vanilla ice cream. It will keep in a sealed container in the freezer for 3 months. Pull it out any time you want to cozy up with a warm mug. Do I have to make hot buttered rum with ice cream? Nope! Ice cream just makes this boozy concoction extra creamy. My Whipped Pumpkin Spice Butter Spread would also work if you want to make this without ice cream. No need to freeze the butter, just scoop it out right from the refrigerator, add rum and hot Milo’s tea. Hot Buttered Rum Batter makes a great gift too along with a bottle of dark spiced rum. Which cup would that be? the classic Irish coffee glass as “an 8-ounce stemmed glass in the shape of a tulip” is perfect. But as long as you use a heatproof glass or mug you’re good to go! Preparing the glass is an important step in making a hot buttered rum, and it’s as simple as keeping the glass hot. Pouring boiling water into a room-temperature glass before you start prepping the other ingredients. This will help keep your finished hot buttered rum piping hot. 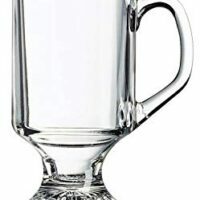 Another option is to just run the glass/mug under hot tap water before pouring your cocktail. Dark rum is best (I use a spiced rum), because it can stand up to the richness of the butter. No need to use high-end spirits, the pumpkin butter and spices can temper the subtle flavors that you are paying for in a more expensive rum — stick with the under $20 rums. How do you serve hot buttered rum to a crowd? Depending on the size of your guest list, you may want to double the batter recipe (below) and have plenty of gallons of Milo’s unsweetened tea. You can make one serving at a time, but you will need to keep the batter in the freezer. Mix batter and tea in a slow cooker a few hours before guests arrive. Set the mugs and rum next to the slow cooker along with a ladle so your guests can self-serve. While a garnish on a cocktail is always optional, it makes them more fun and special. A can of whipped cream, ground nutmeg, and a cinnamon stick will make you look like a rockstar mixologist! 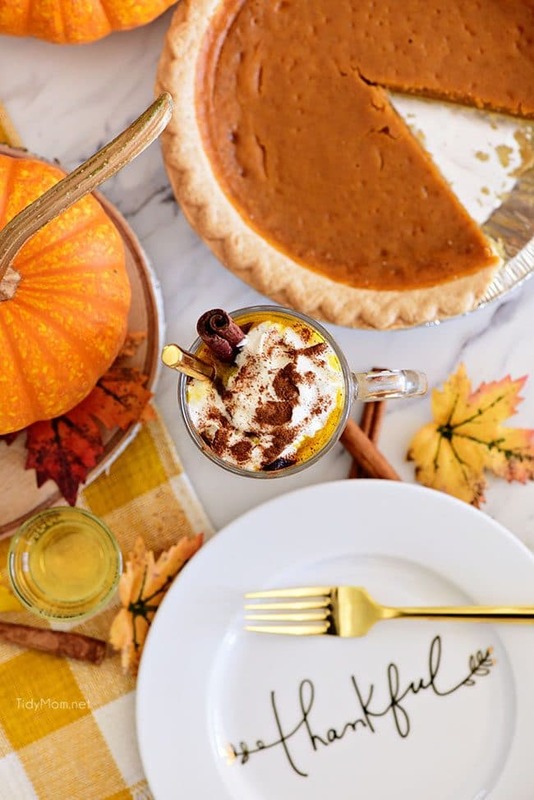 This Pumpkin Spice Hot Buttered Rum would be perfect to serve to your Thanksgiving guests with Gingerbread Pumpkin Bars or a warm slice of Upside-down Apple Pecan Pie. Or to enjoy sitting by a fire after a marathon shopping day on Black Friday. Let the stress and chaos of the season just melt away in a warm mug of pumpkin and rum. Want a kid-friendly hot buttered rum recipe? No problem, just omit the dark spiced rum and add 1-2 fluid ounces of rum extract or rum emulsion to the batter. When ready to build the drink, simply add the rum flavored batter to a mug and pour boiling tea over, stir and garnish if desired. This recipe is kid-friendly! Either way, if you’re a fan of warm drinks in cold weather, this classic drink is sure to become a staple for your holidays! Milo’s Tea is fresh brewed and features natural ingredients. No preservatives or added acids. 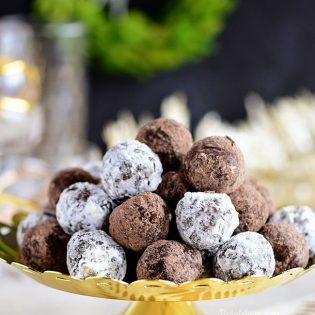 Besides the unsweet variety I used in this recipe, they also have sweetened with pure cane sugar, no calorie sweetened with sucralose options. The only thing that makes Milo’s even more delicious is enjoying it with those you love…….and good food! 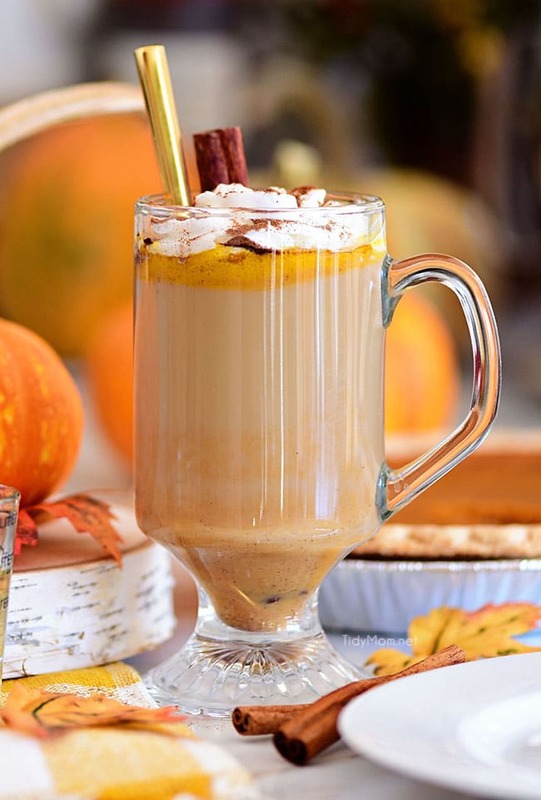 Like This Pumpkin Spice Hot Buttered Rum Recipe? Pin it! If you have just discovered this buttery rummy drink, no doubt you will be wondering how you ever lived through winter without a Hot Buttered Rum. 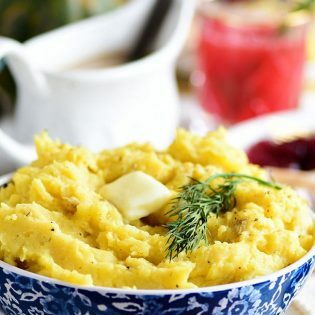 It’s just too simple and too delicious not to make this holiday season! Don’t miss your shot at enjoying a cozy festive drink to warm your soul this season. I can’t wait to hear how much you love it! If you try this recipe let me know what you think! Leave a comment below, rate it, share it on social media, or take a picture and tag @tidymom on Instagram! 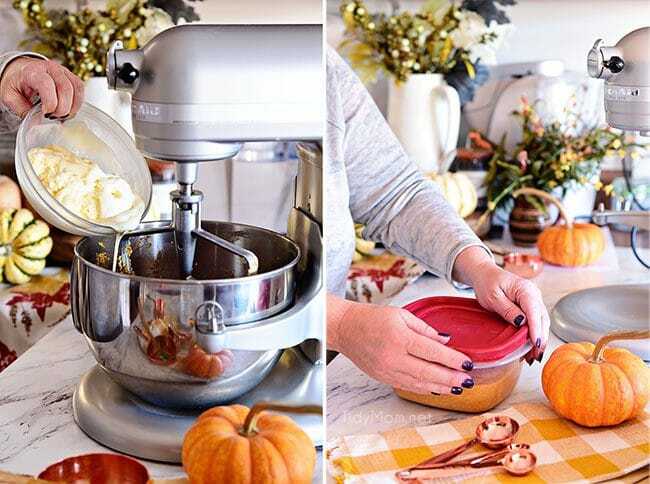 A buttery mixture of pumpkin, brown sugar, ice cream, and spices, this hot buttered rum batter can be made in advance. Serve Pumpkin Spice Hot Buttered Rum by the glass anytime by adding hot tea and rum to the batter. 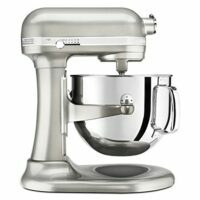 For Batter: Using an electric mixer (or blender) beat softened butter until smooth. Add pumpkin, sugars and spice and continue mixing until well blended. Whisk in softened ice cream. Pour mixture into a plastic container, seal and freeze at least 3 hours (mixture will not turn fully solid). For Cocktail: When ready to serve, bring a few cups of tea to a boil. 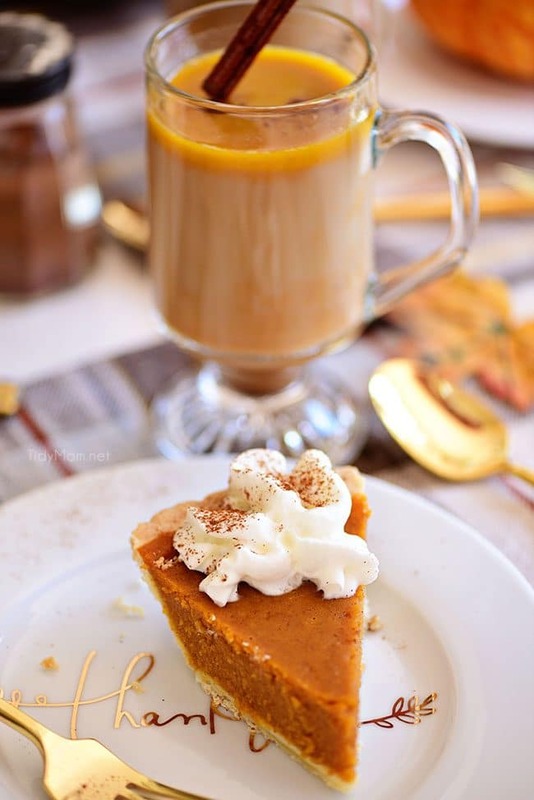 Whisk 1-2 tablespoons of pumpkin butter batter and 1-2 fluid ounces of rum to each warm mug. Pour boiling tea over each and stir. To Garnish: Add whipped cream, a sprinkle of ground nutmeg and a cinnamon stick. This is purely optional but oh so delicious! for a kid-friendly, non-alcoholic version: omit the spiced dark rum and add 1-2 fluid ounces of rum extract or emulsion to the batter. I have Milos right now and definitely making this! Yum! OMG! 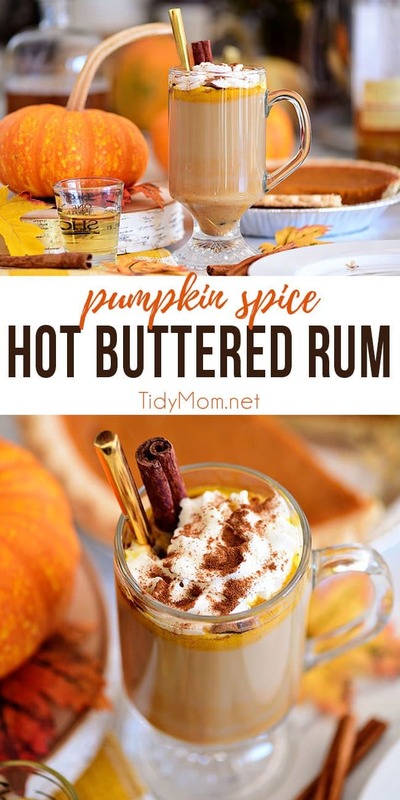 LOVE this spin on Hot Buttered Rum! It’s my favorite holiday drink so I’m totally adding this version to the Thanksgiving menu. I definitely need to try this! Looks delicious! 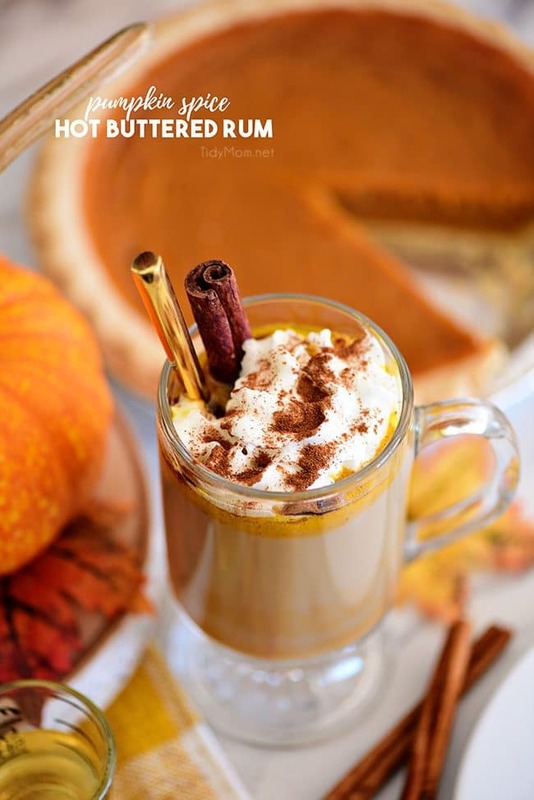 Love this fall drink idea! Wish I was sipping on it right now! Oh I need this cocktail in my life! I must try this recipe asap!